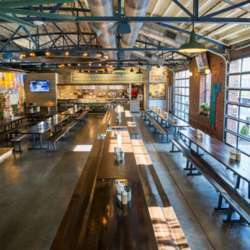 Von Elrod's Beer Hall & Kitchen is a larger-than-life Germantown restaurant with steins of beer from 36 taps! With family style seating we can grab dinner and meet new folks. It is right by the Sounds Baseball Stadium, so if you have not ventured to this area of town you can get some ideas for summer! You should be able to park right on the street for free. There is also a State parking lot that is free to park in after 5PM, that is off of 5th Ave. See you there!